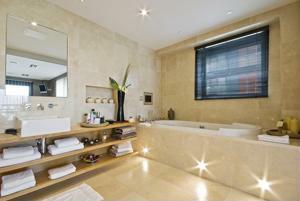 Bathroom Vanities and Accessories Design and Tips | DecorPlanet.com Blog: A television in the bathroom? Whether they want to watch the news and hear the weather while getting ready each morning or plan on relaxing in the bathtub while watching their favorite show, many people planning a bathroom renovation project are incorporating televisions into their designs. According to Better Homes & Gardens, there are many ways to install a TV in a bathroom - nestled in a built-in cabinet, mounted on the wall, out-of-the-way on a special corner bracket, inside a cabinet or on a shelf. The most important consideration is whether it's able to be viewed when needed. Many suggest special fog-free bathroom televisions for use in these high-humidity areas. According to BathroomAndKitchenGuide.com, LCD bathroom television sets should be waterproof and come with a waterproof remote control. Televisions are also available hidden inside of mirrors and mounted onto bathtubs. According to NouveauBathrooms.com, products such as the Baden Bath DVD bathtub make relaxing and watching a movie while bathing simple and easy. "[The bathtub] features a flat panel television screen which folds down, a DVD player, a CD/AM/FM stereo system with dual remotes, and is even equipped with a cooler for wine or your favorite beverages. The tub also features ten whirlpool jets and a heater to keep the bath water hot for the duration of your bathing experience."